When the wind blows, we can see the power of mother earth, and when it blows hardest as in a hurricane we can see her full fury. The threat of hurricane speed winds should not be taken lightly. It is something everyone who lives in hurricane areas should be aware of and prepare for as best they can. To do that government agencies and organizations have set up elaborate warning systems, and guidelines to aid survival should a hurricane hit your part of the world. What: Basically a hurricane is a massive storm system that grows out of the warm tropical waters of the Atlantic Ocean. In the North Pacific they are called typhoons, and in other parts of the world they are known as cyclones. All are basically the same type of weather system, with a swirling vortex of high winds and heavy rains conjured up by the flow of ocean currents far out from land. When: There are specific times for hurricanes in the Atlantic and the Pacific oceans. In the Atlantic the hurricane season lasts from the beginning of June until the end of November. The of hurricanes peaks with some of the strongest from mid-August through to the end of October. The Pacific season sometimes starts a little earlier in mid-May, and peters out by the end of November. Where: Most of the US Atlantic and Gulf of Mexico coastline is likely to be affected by heavy rainstorms, and strong winds causing tidal surges and flooding. The effects of these hurricanes or tropical storms can be felt up to a hundred miles inland. All of the islands of the Northern Caribbean can also be affected by these mighty storms. In the Pacific, all the island chains can be affected, along with the Asian mainland from Japan in the north to Vietnam in the south. Anyone living in an area prone to hurricanes, typhoons, or strong tropical storms should be prepared for mother nature’s worst. Nowadays there is usually enough warning for most people to be fully prepared for any eventuality, giving them enough time to reach safety once a storm warning is given. If you are ordered to evacuate your home, you should know where you are going, and the route you are going to take. Decide well beforehand where you intend to stay should the hurricane warning be made, and contact your final destination as soon as possible to advise of your imminent arrival. Have a go-bag ready and waiting should you need to leave quickly. This should include your disaster kit, along with a first aid kit, and medications you or your family might need, flashlights, batteries, and some cash. If you are not given the call to evacuate, and decide to stay in your home while the hurricane passes plan to have enough stocks of food and water to keep you self sufficient for at least three days. Work on the assumption that all the power will be knocked out at some time during the storm, and you will need to have supplies for cooking and lighting. Consider alerting a family member or friend who lives outside of the affected area that you are staying at home, and keep in contact with them for as long as possible. If you do decide to stay at home make sure your home is properly prepared for the coming blow. The high winds can bring down branches and trees, so well before hurricane season have an arborist check any trees you have in the garden for possible hazards. Remove any dead of weak branches, and consider felling any diseased trees as a precaution. On the house itself, check all the guttering and downpipes. Make sure they are clear of debris, and securely fastened to the building structure. While you are looking at the guttering, see if the roof needs repair and get it done well before hurricane season is upon you. Power outages are inevitable in heavy storms and hurricanes so purchase a generator, and stock up with enough fuel to keep it running for a couple of days. Make sure it is stored in a dry place well away from windows or doors. A Hurricane Watch notice will be announced when a storm is potentially 48 hours away from a particular location. This is a time to take stock of your options to evacuate if required or review you disaster kit, and supplement it with any items needed for the family or anyone staying with you at the time. A Hurricane Warning is usually given 36 hours before the winds are expected to increase and the storm is likely to begin hitting your location. If the local authorities order an evacuation, follow their instructions immediately. Make sure your friends and family know what you are doing, and organize with them how you intend to keep in contact during and after the storm. Use the radio and TV to keep updated on the latest weather conditions and any instructions from the authorities. Check your hurricane preparedness kit is complete, and you have enough food and water for at least three days. Keep the gas tank of your vehicle full, and it has a stock of emergency supplies and extra dry clothes should the ones you are wearing get soaked. The next eighteen hours are crucial in getting your hurricane preparations complete. If you are staying at home or leaving, make sure that any lightweight objects are brought inside the home. Garden furniture can become deadly projectiles in the high speed winds of a hurricane. If it cannot be brought inside the home make sure it is securely anchored to the ground. If your home has storm shutters, check that they are all in working order, and will not come lose in the storm. If not, then use marine plywood to board up the windows by securely nailing panels to the frames. With less than a day before the hurricane is expected to hit, you should have all your plans in place. Keep listening to the radio and TV for storm updates every 30 minutes. With the storm so close the situation can change rapidly. Make sure any electronic devices such as cell phones and tablets are fully charged. Should the power go out you may not be able to recharge for some time while the hurricane passes. With just 6 hours to go before the hurricane is expected to arrive, check in with your family and friends to give them all the information you can about your situation. You may have to evacuate at this late stage so keep in contact as best you can. Go around your home to secure the storm shutters. In the kitchen, put the refrigerator and freezer to the coldest they can go, to prolong their cooling of the food inside. Try to open the doors only when necessary. Water – Two gallons per person per day is a good rule of thumb. One gallon for drinking and the other for washing and sanitation. Make sure there is enough for three days. Food – Best to have non-perishable items, and have enough to last three days for all the family. If you are stockpiling canned goods, then don’t forget a manual can opener. You’ll also need some type of mess kit to eat from. This can be the type used in camping, or just a good stock of disposable plastic plates and cutlery. A battery-powered, or wind up radio to be able to listen to news broadcasts without mains power. Extra batteries are advisable. Flashlights – should the power go out you will need something to help you find your way around in the dark. Again make sure you have a good stock of batteries. 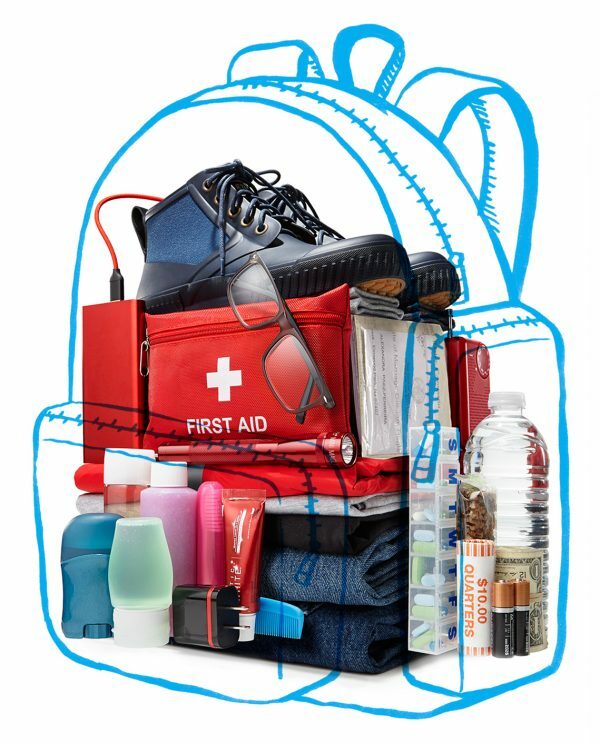 First aid kit – Best to have one for the home, and one for each vehicle you might use during an evacuation. The kid should as a minimum contain the following: Half a dozen 2-inch and 4-inch gauze pads, three triangular bandages, rolls of sterile bandages and adhesive tape, scissors, tweezers, antiseptic, a thermometer, latex gloves, tongue blades, a tub of petroleum jelly, a cleanser and moist towelettes, needles and sunscreen. For personal sanitation you will need moist towelettes, garbage bags, and plastic lock-ties. Dust masks for all the family members should there be any contamination in the air. A wrench, pliers and hammer to deal with any emergency involving utilities. Cell phones with chargers and extra batteries. Prescription medication – make sure you have a good stockpile of any pills you need for at least a week or more, so you have enough to cover your medical needs until all local services are restored. ✓ Nonprescription medication, such as anti-diarrhoea pills, antacids, pain relief or laxatives. ✓ A spare pair of glasses and extra contact lens solutions. ✓ Feminine supplies and items for personal hygiene. ✓ Everything you need to care for a baby if you have one, diapers, wipes, creams, infant formula and feeding bottles. ✓ If you have a pet make sure you have pet food, and a water bowl. ✓ A bottle of household bleach and a small pipette which can be used to disinfect water. ✓ A complete change of clothes for each family member, as well as sturdy shoes. ✓ Sleeping bags and warm blankets for everyone. ✓ A box of matches should be kept in a waterproof container. ✓ A pencil and paper to write on. ✓ Books, games and puzzles to keep the children amused and active when waiting out the storm. ✓ Have a copy of any important family documents in a waterproof container, or have electronic copies saved to the cloud. ✓ A wad of cash or traveler’s checks to buy essentials should electronic payments not be available in the aftermath of the hurricane. 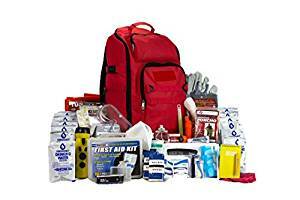 Your hurricane emergency kit needs to be in a place where everyone in the home knows and is easily accessible. Any stored water should be replaced every six months at the latest, along with any foodstuffs that are past their sell-by date. Also replace the spare batteries. Check with your pharmacist about the expiry date of any medicines you might require to keep in storage. Keep listening to the radio to see when it is safe to leave your home, or return home if you have been evacuated. Once the storm has passed, try and contact your family and friends to tell them you are OK. If you are venturing outside them be careful of any downed power lines or cables. Avoid walking or driving through any flooding. Just a few inches of fast flowing water can knock someone over, and should there be a downed power cable hidden in the water it could electrocute and kill you. Take photos of your property, and the surroundings as it will assist in the insurance assessment later. If your home has been damaged in any way, try and minimize any further problems by covering with a tarp.